The hockey season is wrapping up and the offseason is here! For the Hockey Hut, that means training time! We love the offseason because we love seeing the transformation that happens in players as they put in the time and energy to take their skills to the next level. We put together 10 key factors in producing the best long term athlete development program. Start building your player into an elite athlete today, no matter their current skill level! Learning the basic movement and sports skills should be made fun! Coming up with games, challenges and partner training drills can add fun to player development. Adding variation in sports and games can help kids build up their skills and develop their overall athleticism. Kids who play multiple sports are more likely to see success in athletics. Sports are defined in two categories: early and late specialization sports. For example, many young girls will start in dance and gymnastics at an early age, but as they develop and grow, many will retire from the sport before age 20. Contrastingly, hockey is a late specialization sport in which most players reach their full potential until their adult years when they are fully developed. By not specializing in a sport early on, kids get greater exposure to athletic development, lower risk of injury and increase their athletic potential. As kids develop physically and psychologically, there are clear stages that lend themselves to opportune times for player development. For young players, the first stage of development is focusing on outcomes, rather than development. Ages 6-10 focusing on flexibility and mental growth is important for kids as they learn the psychology of sports and what it means to lose and win. As children develop in the 9-12 year range, it’s time to add in more intense physical training skills and sustenance and structure. This can look like a training regime paired with muscle development and proper diet. The 10 year -10,000 rule is the summation of 10 years of practice at 3 hours a day to become proficient in a sport. This doesn’t mean 10,000 hours of hockey, rather a mixture of athletic development – running around outside, playing on the playground, swimming in the pool. Research shows that development at this level is needed not only for sports but any skill we develop such as playing an instrument. It takes a tremendous amount of time to become an elite athlete. This is where player development is crucial to get started early. Talk to a local sports training center and see what is best for your kid. Mental training and prep is one of the most overlooked aspects of sports development. Having emotional intelligence is crucial for any player who wants to make it to elite hockey play. Start by talking to your child about how they feel after a game, a hard loss, or a big win and help them to become self-aware of their own emotions. Currently, most player development is focused on chronological age, putting kids in the same age group for all of their training. The reality is that sometimes keeps in the same chronological age group may be 4-5 years apart in their development. You can help develop your player by putting them around players who are close to them in skill or slightly above and not just in their age group. This will help them develop faster and improve their skill set where they are weak. Periodization is the process of breaking down the calendar year into various time intervals of training. These periods include preparation, practice, competition, rest, and recovery. It is critical that athletes optimize their development by applying these periods in their annual training. Research shows that kids should have a two month period every year between sports where they are able to rest and recover. In addition, in repetition training sports such as baseball and hockey, it is critical that players maintain a healthy rhythm of rest and practice/competition to prevent injury and developmental issues. Many players will spend time in a club sport team, school sports, and training facilities this year. Each of these can be great for player development while also imposing challenges. Players need to have a clearly defined, structured, and consistent schedule that allows them to develop in a healthy manner. As a parent, you can work with trainers and coaches to make sure everyone is on the same page and has your players best interests in mind. Every year kids will travel all over the country for tournaments and competitive play. 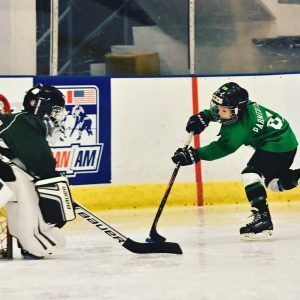 We as parents need to be better at scheduling and allocating our players time on the ice, field, or court. This means being open to a training based schedule throughout the year and not just going from tournament to tournament. Take some time to sit down as a family and determine what your capacity is, how many tournaments you will attend and book them out in advance. This prevents over planning and keeps your player healthy all year. Continuous Improvement: Continuous improvement is a key principle for any athletes long term growth and success. Don’t stop once you think you have reached a goal, rather celebrate the victory, have fun, and look to what is the next step. Becoming an elite player requires investment and continual improvement always.